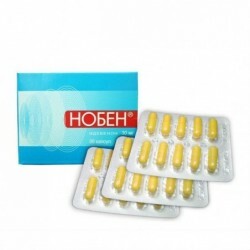 Nootropic combination drug, also has vasodilating properties. 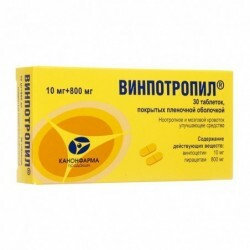 Improves cerebral circulation, causes a slight decrease in systemic blood pressure. 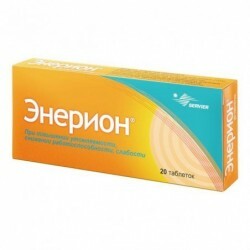 It increases the resistance of brain cells to hypoxia, facilitates the transport of oxygen and substrates of energy supply to tissues (due to a decrease in the erythrocyte affinity for oxygen, increased absorption and glucose metabolism, and a switch to aerobic processes). It promotes the accumulation of cAMP and ATP in the tissues, an increase in the content of catecholamines in the brain tissues. The vasodilating effect is associated with a direct relaxing effect on the smooth muscles of the vessels, primarily the brain. The drug does not cause the phenomenon of robbery and increases the blood supply to the ischemic area of ​​the brain, without affecting the blood supply to intact areas. It improves microcirculation in the brain by reducing platelet aggregation, reducing blood viscosity, increasing red blood cell deformability. It has a positive effect on metabolic processes in brain cells, increases ATP concentration in brain tissue, enhances the synthesis of ribonucleic acid and phospholipids, as well as glucose utilization. It improves the integrative activity of the brain, contributes to the consolidation of memory, facilitates the process of learning, changes the speed of propagation of excitation in the brain. 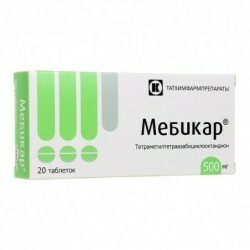 Enhances alpha and beta activity, reduces delta activity on EEG, reduces the severity of vestibular nystagmus, improves communication between the hemispheres and synaptic conduction in neocortical structures, increases mental activity, increases cerebral blood flow, does not have a sedative, psychostimulating effect. The effect of the drug develops gradually. The course of treatment and dosage is determined by the attending physician. For patients 18 years and older: by mouth, regardless of food intake, 1 tablet 2 - 3 times a day, drinking plenty of water. Last admission - 4 hours before bedtime. The duration of treatment is from 2-3 weeks to 2-6 months. 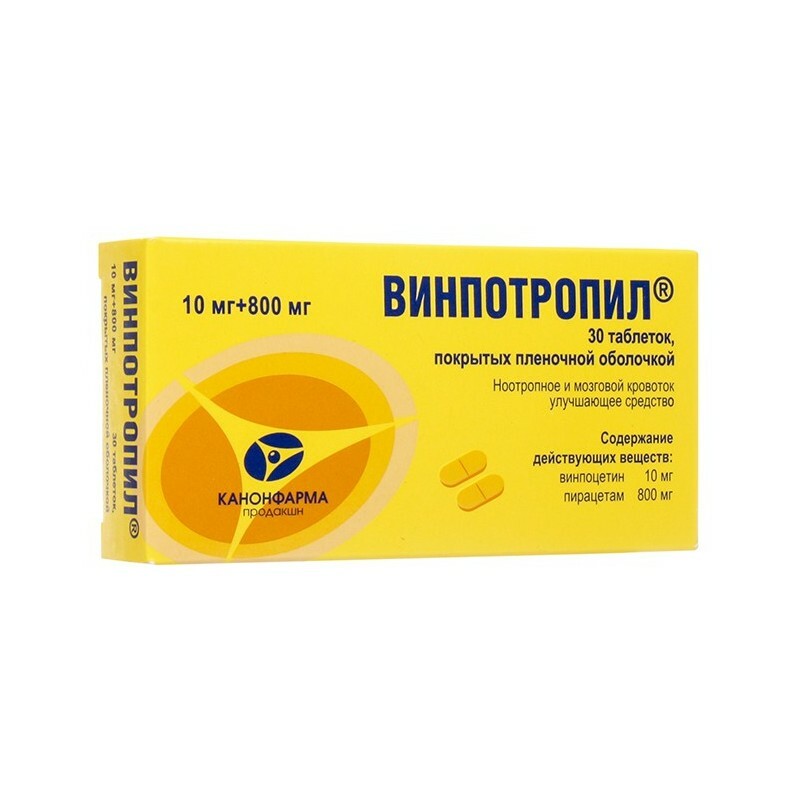 Before drug withdrawal, it is recommended to gradually reduce the dose (possibly using Vinpotropile® in another dosage form: capsules containing 5 mg of vinpocetine and 400 mg of piracetam). On the part of the cardiovascular system: ECG changes (ST segment depression, prolongation of the Q-T interval), tachycardia, extrasystoles, blood pressure lability (BP) (more often, decrease). From the side of the central nervous system (CNS): motor disinhibition, irritability, depression, asthenia, dizziness, headache, sleep disturbance (insomnia, increased drowsiness), mental agitation, imbalance, exacerbation of epilepsy, anxiety, hallucinations, confusion, extrapyramidal disturbances, reduced ability to concentrate. On the part of the digestive system: nausea, vomiting, heartburn, diarrhea, abdominal pain, loss of appetite, gastralgia, constipation. On the part of the metabolism: weight gain, increased sweating. On the part of the skin: dermatitis, pruritus, urticaria, skin flushing. Allergic reactions: hypersensitivity, anaphylactic reactions, angioedema. Local reactions: pain at the injection site, thrombophlebitis. Other: fever, general weakness (may be a manifestation of the underlying disease), increased sexual activity. Violation of hemostasis, extensive surgery, heavy bleeding, chronic renal failure (CK 20-80 ml / min). A slight increase in the hypotensive effect is possible with simultaneous use with methyldopa (control of blood pressure is necessary). Weakens: the effect of anticonvulsant drugs (reduces convulsive threshold). Despite the lack of data confirming the possibility of interaction, it is recommended that caution be exercised while simultaneously prescribing with drugs of a central, anti-arrhythmic action. 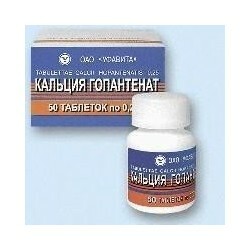 The drug is contraindicated in pregnancy and lactation. The presence of a prolonged QT syndrome and the use of drugs that cause lengthening of the QT interval require periodic ECG monitoring. 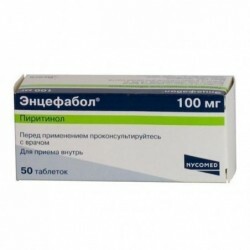 Due to the effect of piracetam on platelet aggregation, caution is recommended when prescribing the drug to patients with impaired hemostasis, during major surgery, or to patients with symptoms of severe bleeding. During the period of treatment, care should be taken when driving vehicles and working with mechanisms. Symptoms: abdominal pain, diarrhea mixed with blood. Treatment: symptomatic therapy, hemodialysis (efficacy of 50-60%).